The FTSE 100 index has narrowly missed out on an all-time closing high after slipping back from record levels. The UK’s benchmark index hit its highest ever level during trading at 7,129.83 shortly after midday. But it then fell back in the afternoon, to finish the day 0.4% lower at 7,070.88 points. Analysts said the stocks initially gained from falls in sterling, which extended its worst run since the Brexit vote to drop below $1.22 and €1.10. The index broke its last intra-day high from 27 April 2015, when it reached 7,122.74 points, but could not hold on to beat that day’s record closing high of 7,103.98. FTSE investors took their profits in the afternoon, sending the index down again, because “this is not a rally based on lots of confidence”, he told the BBC. “The weak pound is ‘good’ for the 100 but overall we have to remember that the weak pound is a symptom of much deeper worries about the UK economy and Brexit,” he added. Sterling fell nearly 2% against the dollar on Tuesday to hit $1.2106 and 1.1% against the euro to €1.0964. The pound is at its lowest level since Friday’s flash crash, when it tumbled to around $1.18 before recovering. 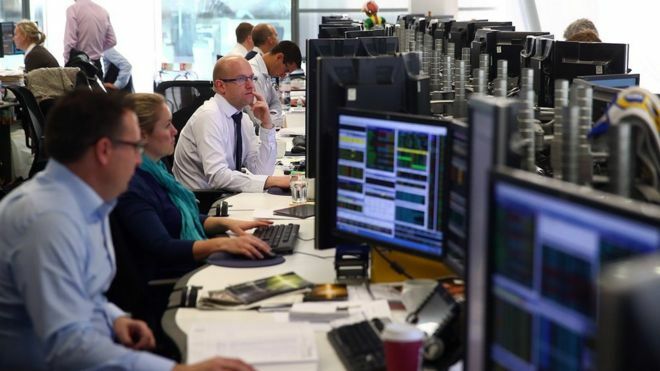 Some traders said sterling’s further falls were linked to reports on Tuesday that Russian bank VTB and US banks Citi and Morgan Stanley could move staff outside of London, adding to worries about foreign investment leaving the UK. Others pointed to leaked documents warning that a withdrawal from the EU single market could cost the Treasury more than £66bn a year. Also on Tuesday, a senior official at Norway’s sovereign wealth fund, the world’s largest, said Friday’s flash crash had correctly reflected expectations for the UK economy. The fund is one of Britain’s biggest foreign investors, holding shares in most large UK companies and a stake in London’s Regent Street. Sterling has now fallen about 18% against the dollar since the referendum to lows not seen since 1985. However, the UK is not facing a “currency crisis”, according to Gerard Lyons, the former chief economic adviser to Boris Johnson and a leading Brexit campaigner. “There’s no hard and fast rule, but you tend to know a currency crisis when you see it,” Mr Lyons, who is now a strategist at Net Wealth Investments, told the BBC. He added that a fall in sterling was “inevitable, whatever the outcome of the referendum” because it had been one of the world’s most overvalued currencies.